My summer style can be summed up with one word: skirts. I’m not a fan of shorts. I can do capris and I can do some of the longer shorts, but the short shorts that are so often on store shelves just don’t cut it for me. But skirts are it for me. So often people will joke that I’m “all dressed up” when in actuality I am more comfortable in a summer skirt than most of my other outfits year round. It’s one of the many reasons I love the summer so much. This Aurora Skirt from Athleta is the kind of skirt I’m talking about. It’s stretch cotton so you’re going to be completely relaxed in it. You can easily match it with all kinds of topics in any of the solid colors it’s available in. Love this Snakeskin Print Skirt from Ann Taylor Loft from $59.50 makes for a run outfit paired with a plain white tank. Forever21 is a great store for price alone. They have tons of wonderful pieces for half the price tag you’ll find at the usual haunts. I definitely have to comb the racks at time because some of the pieces are a little young but I can almost always find something. This Woven Eyelet Skirt is only $19.80 and has a soft and feminine. 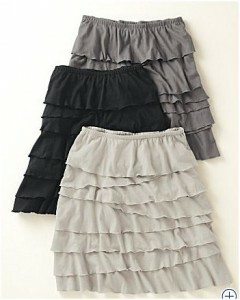 And I’ve been coveting this Barcelona Layered Skirt from GarnetHill.com for $68. I could see getting tons of use out of this skirt that pairs well with just about any top. Looks super comfy too! Great skirts! Thank goodness spring has arrived. Completely agree with you about wearing skirts! Plus, it makes you look so much more “put together” than a pair of jean shorts would! Totally agree about skirts over shorts regarding the comfort issue. I very often wear my tennis skirt around the house instead of a pair of shorts. Love the Garnet Hill layered look pictured above. And the Ann Taylor Loft one reminds me of a favoride grey skirt I wore’ in my hay day’. . the word ‘dirndl’ just came to mind- waistband with material slighly gathered at the waist. . another easy slide on article of clothing. Yep, skirts get my vote.